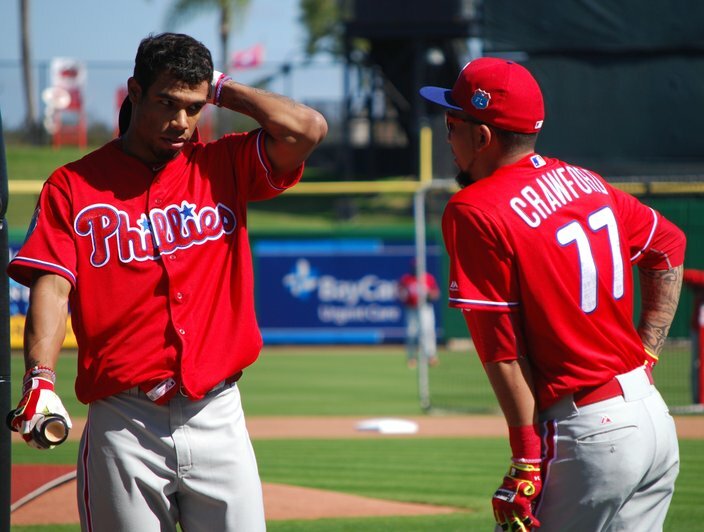 J.P. Crawford, watching fellow prospect Dylan Cozens take batting practice this spring, sees big things in the Phillies future: "All of our guys that are there, I've grown up playing with them at Triple-A, we're all here. I feel like we're all just one step away to finally go for it, go for it all and get a World Series. It's going to start here, in Double-A and Triple-A. It'll pay off then." CLEARWATER, Fla. – Earlier this month, in between the monotonous reps of ground balls during pregame batting practice in Spring Training, a non-roster veteran pulled a top prospect aside quickly for a few words of encouragement. Chris Coghlan, the 31-year-old former National League Rookie of the Year bidding for a major league bench job this spring with the Phillies, genuinely liked what he saw from the organization’s top prospect, J.P. Crawford, and wanted to make sure the 22-year-old, kid shortstop knew what he thought. “I said, man, you know what, I just want to encourage you,” Coghlan recalled the other day inside the home clubhouse at Spectrum Field, where Crawford and fellow top prospects Nick Williams and Jorge Alfaro packed their bags, bound for minor league camp on Friday morning. “There are certain things he just does really well and I wanted to encourage him,” continued Coghlan, who spent the majority of the least three years with the Chicago Cubs. ‘I think you've got a chance to be a real special player.’ He reminds me of (Cubs shortstop) Addison Russell. Just his aura, his personality. … (Russell’s) footwork was excellent for a young kid. Addie doesn’t have the best arm but has some of the best footwork you’re going to find for a shortstop. And when I watched J.P., he just kind of reminded me of that. And he has a better arm than Addie. Crawford, the former first-round pick who played the majority of the 2016 season at Triple-A Lehigh Valley, is expected to make his major league debut at some point this summer. He spent a month in major league camp this spring, longer than his first go-around a year ago. 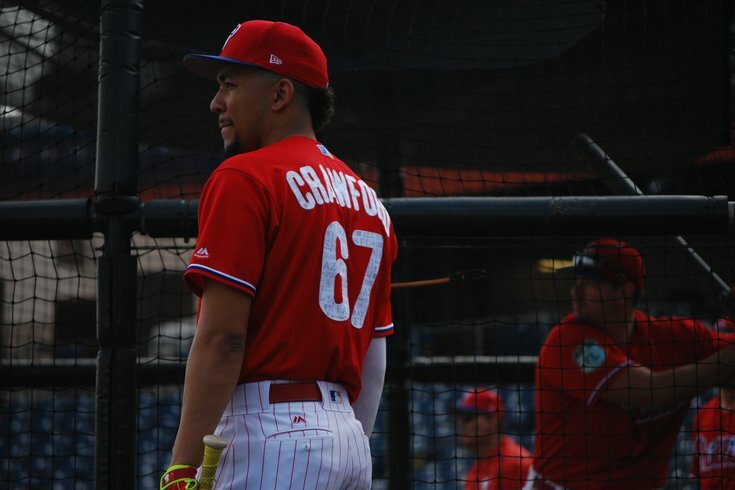 Crawford – along with Alfaro and Williams – can take the big league experience they gained in the last five weeks down into minor league camp, and then to Allentown, too, as they take the next steps in their journey to a permanent spot on the major league roster. And that experience wasn’t just limited to stepping into the batters’ box against major league pitchers in Grapefruit League games. The Phillies can only hope Crawford can replicate Russell’s early success in the big leagues in the coming year – and that the organization’s young core as a whole can follow the path of the World Champion Cubs, who rode a nucleus of former prospects to October glory last fall. Crawford, Alfaro, and Williams will begin the 2017 season at Triple-A Lehigh Valley. As with Crawford, Alfaro and Williams were able to grow as players in their monthlong stay in major league camp. Coming off a disappointing first full season in the Phillies organization, the 23-year-old Williams hit .286 (8-for-28) with a .375 OBP, one home run, one double, and five RBI in 15 games. Williams also stole two bases. Perhaps most impressively, he walked four times (while striking out seven times). Last season, Williams had just one walk in 46 games at Triple-A Lehigh Valley. The rising outfield prospect said he benefited from working with new hitting coach Matt Stairs. Alfaro, who came to the Phillies with Williams in the Cole Hamels’ trade, played in just five Grapefruit League games. He spent a good chunk of March playing for Colombia in the World Baseball Classic. Unlike Crawford and Williams, Alfaro got a brief taste of the big leagues at the end of last season, so it was a little tougher to get called into the manager’s office on Friday and hear the news that he was being sent across the Carpenter Complex to minor league camp. Phillies catching prospect Jorge Alfaro got a taste of the big leagues last September. “It’s always hard to hear those kinds of words, getting sent down,” Alfaro said. “But it is what it is. You just have to go there and keep playing hard, keep doing what you’re doing and keep playing 100 percent all the time. The trio of prospects – the top bats in the farm system, along with recent No.1 overall pick Mickey Moniak – are all on their own individual timelines. But when they return to the Phillies clubhouse together, for good, they plan on helping to put the finishing touches on the organization’s multi-year rebuild and forming the next contending team in Philadelphia. The Phillies also reassigned three others to minor league camp on Friday: outfielder Cameron Perkins, infielder Taylor Featherston, and right-handed pitcher Pedro Beato. Additionally, the Phillies optioned right-handed pitching prospect Ben Lively to minor league camp following Friday's game.